The temples spread across Atlanta and surrounding cities—Hindu Temple of Atlanta, Shiv Mandir, Siddhi Vinayak Mandir, Sadhana Mandir, Gokuldham, Yugal Kunj, Greater Atlanta Vedic Temple, Sadhana Mandir, Shree Shakti Mandir, Sanatan Mandir, Shirdi Sai Temple, BAPS Swaminarayan Mandir—and other community organizations celebrated Mahashivaratri with a variety of cultural programs and pujas from March 2-5, 2019. Long queues of devotees were seen at different shrines and temples since the break of dawn. 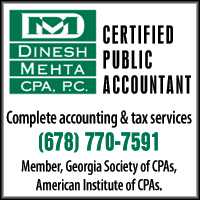 Mahashivaratri is celebrated according to the lunar calendar, so the dates vary every year. It is celebrated on the 13th night and the 14th day of the Hindu calendar’s Phalguna month, generally between February and March. In the United States, Mahashivaratri 2019 was Monday, March 4 and extended till March 5, as celebrations continue until late night and devout people observe a fast for the entire day. It is believed that the planetary positions on this night are such that there is a powerful natural upsurge of energy in the human system, enormously beneficial for one’s physical and spiritual wellbeing. 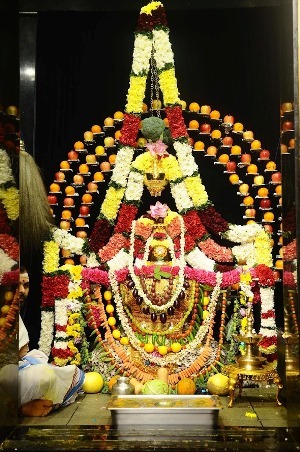 Sakambara Alamkaram - Siva Lingam decorated with vegetables. Decorated Siva Lingam. 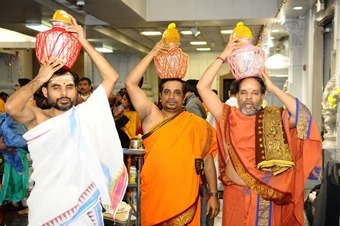 The Hindu Temple of Atlanta (HTA), Riverdale, celebrated this much awaited festival for two days in South Indian style on Saturday and Monday in the Siva temple dedicated to Sri Rama Lingeswara and His consort Parvata Vardhini. From early morning on Monday and continuing through the night, many rituals were performed as prescribed in the scriptures. 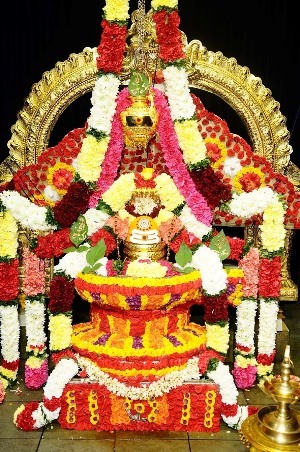 Finally, Lingodbhava Kubera Paasupatha Abhishekam was held at midnight in hopes of wealth bestowed by Siva. HTA’s president Sheela Lingam said that 3,000 plus devotees visited the temple on Mahashivaratri, more than had been expected, packing the parking and dining areas. Since it was on Monday this year, it was very auspicious for worship of Lord Siva. Long lines of devotees patiently waited for their turn for abhishek, offering milk to the Siva lingam. Traditional/classical dances and bhajans depicting Lord Siva and Parvati stories were excellent, with performances by local classical dancers. The wedding of Sri RamaLingeswara and Parvata Vardhini was depicted with all traditional rituals. 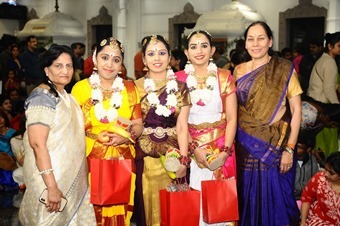 (Left) HTA President Sheela Lingam and Puja Committee chair Padma Koganti with dance performers. Aditya Jaganathan, a software professional and a temple volunteer said, “I am volunteering in the temple for over seven years now. 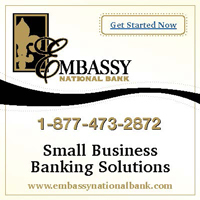 We enjoy doing the service. 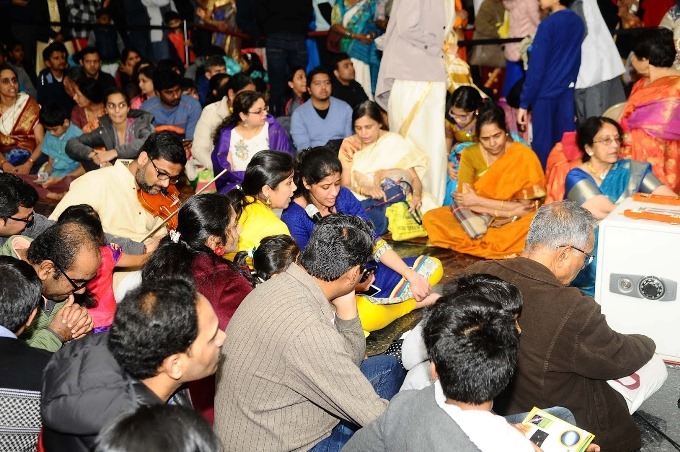 Mahashivaratri is so special, because the way the priests do pujas here you cannot find anywhere in United States.” Celebrations at HTA concluded in the early hours of March 5 with the customary mantra Pushpam, Mangala arati and distribution of mahaprasadam to the assembled devotees. The HTA celebration on Saturday, March 2 included Anugna, Maha Ganapati Puja, Punyahavachanam, Raksha Bandhan, Mruttika Snapanam, Rutvikvarunam, Akhanda Deepa Aradhana, Mandapa Devata Avahanam, Ekadasa Rudrabhishekam, Lalita Sahasranama, Siva Sahasranama, Trishati Pujas and Bilva Archana. The Saturday program ended with Visesha Harati and distribution of Maha Prasad. Maha Sivaratri at Hindu temple of Atlanta, Riverdale started early morning on Monday, March 4 and continued all through the night. The whole event witnessed a lot of rituals that included Ashtottara Kalasa Sthapana, Rudra Homam, Pujas, Archanas, traditional Pahari/yaama abhishekams to presiding deity Sri RamaLingeswara (Siva Lingam) in different timings all through the day as prescribed in the scriptures. 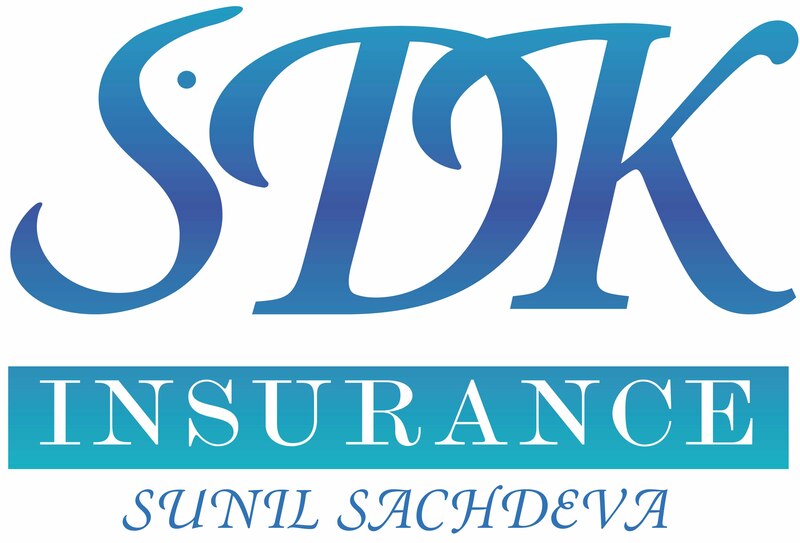 Devotees observed fasting and spend the day and night engrossed in worship of Lord Siva. The temple resident priests, Srinivasa Sarma Adarasupally, Pavan Kumar Kistapati, Siva Naga Kumar Dusi, Sunil Kumar Durgaraju, Bharath Yaddhanapudi and MKS Subrahmanyam performed all rituals to the satisfaction of all devotees. 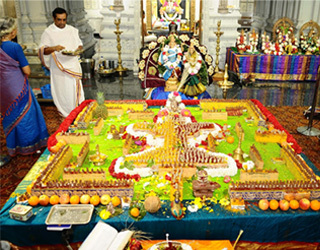 Lingodbhava Kubera Paasupatha Abhishekam was held at midnight 12 AM (March 5). 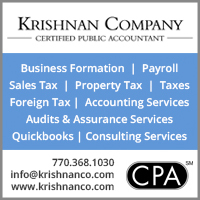 Devotees believe performing special Kubera Paasupatha Abhishekam bestows wealth by the grace of Almighty God Siva.